What food do you turn to most often? For me, it's Chinese food whenever I am in need of something tasty or reminding me of childhood. 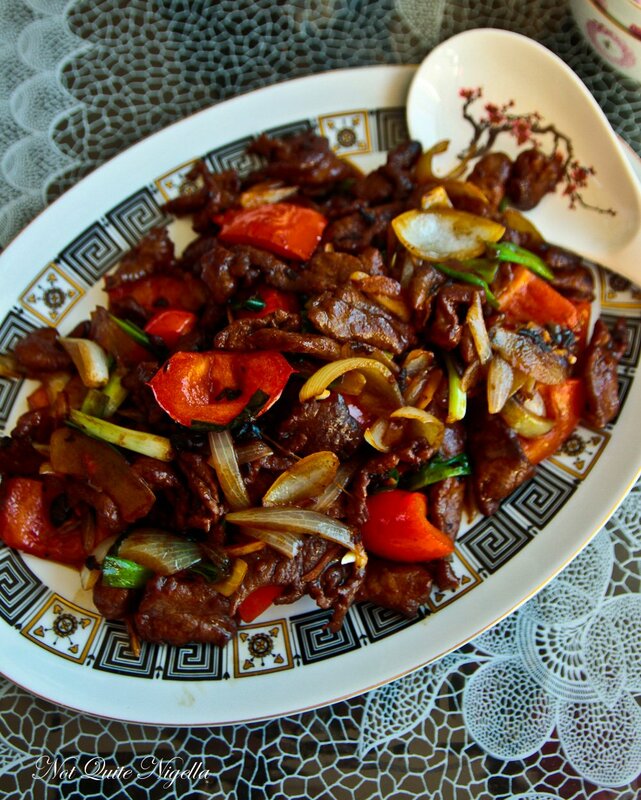 Here my mother shares her recipe for Beef in Black Bean Sauce. This Chinese restaurant classic is easier to make than you would think with the whole production taking less than half an hour! For the last 6 months last year I was plagued with illness. It was a never ending cycle of flu and cold. I wasn't the only one, my travel writer friend Ute was the same. We just never seemed to get better no matter how hard we tried and how much rest we had. Until it dawned on me: I was travelling too much. I know, I know, first world problem huh? And it's true, I'm not going to get nor do I deserve or seek any sympathy. But I decided to do one thing this year and that was only to do travel that I really wanted to do. Because the travel that I do is still work, it's pleasurable and the best work but there's no chance of zoning out and relaxing because there are a million things to see and do and there are schedules to adhere to. And last year my body was saying "enough" to me. When I do get sick, the only thing I want to eat is my mother's food. A part of us goes back to being a child and being taken care of. When I was sick as a child we were given something easy to digest like congee or won ton soup. I had a distinct memory of pushing away a bowl of it when I was young, sitting at the plastic tablecloth covered table (it was the 70s), my arms sticking to the plastic and then sighing deeply. I couldn't even muster up the strength to eat one of my favourite dishes. So this year I haven't been travelling as much as I used to. I've been doing fewer overseas trips (so far only Scotland and Taiwan) and I now concentrate on road trips within a few hours where we live when Mr NQN can come along. I've started taking immunity vitamins for the first time in years and touch wood or perhaps it's a placebo effect, but I haven't actually gotten sick once this year so far. 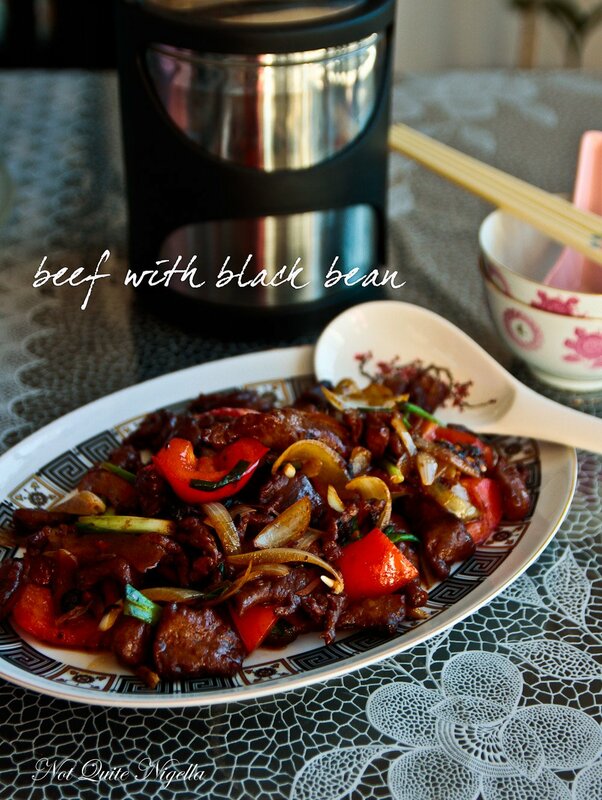 Another dish that my mother makes and I crave when I am sick is this beef in black bean sauce. This suburban Chinese restaurant classic is a popular one, often served on a sizzling hot plate and brought to the table eliciting an excited murmur from kids. I asked my mother to share her delicious recipe with us and she opened up her folder and copied it down for me and I went over to make it with her. I put aside a couple of hours for it but was so pleasantly surprised when it was done and dusted in less than half an hour! I know I always say this but the ingredients list is long but necessary for the full volume of flavours but they're also things that if you cook Asian food often you may already have in the fridge. You can buy salted black beans at Asian grocery stores, they're usually sold in large bags. And once everything is prepped it has less than 10 minutes' cooking time. Which means of course you can do it if you're feeling under the weather! So tell me Dear Reader, what did you parents give you to eat when you were sick as a kid? What do you crave? And do you have many of these ingredients already in your pantry? How often do you cook Asian food? 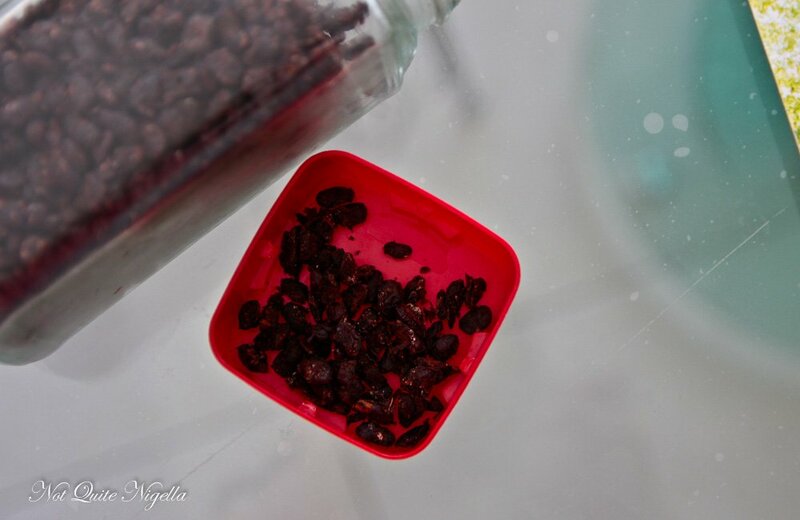 Buyer's tip: salted black beans can be found at Asian grocery stores usually sold in bags. Step 1 - Mix all of the ingredients in the seasoning mix together. Mix all of the gravy ingredients together in another bowl and set aside until the last step. 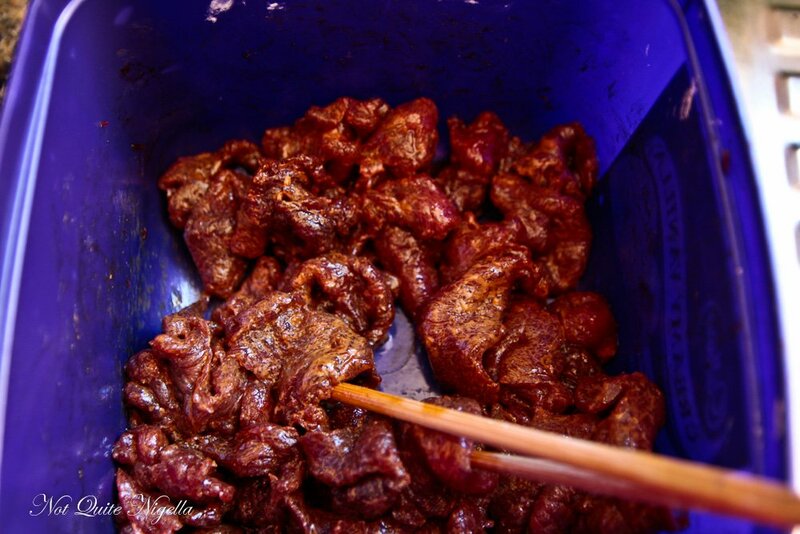 Take the seasoning mix and stir it into the beef slices. Allow to marinate from anything from 20 minutes to overnight. 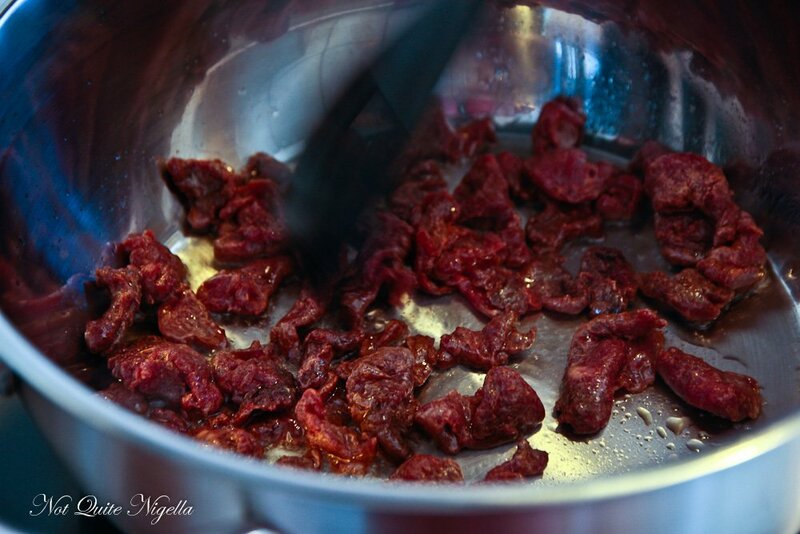 Step 2 - Add 4 tablespoons cooking oil to a wok or a frying pan and when it is hot, add the seasoned beef and fry until browned. Remove from pan and set aside. Step 3 - Add another 2 tablespoons of oil and add the onion, garlic and ginger and fry. Add in capsicum and black beans. and cook until capsicum is cooked. 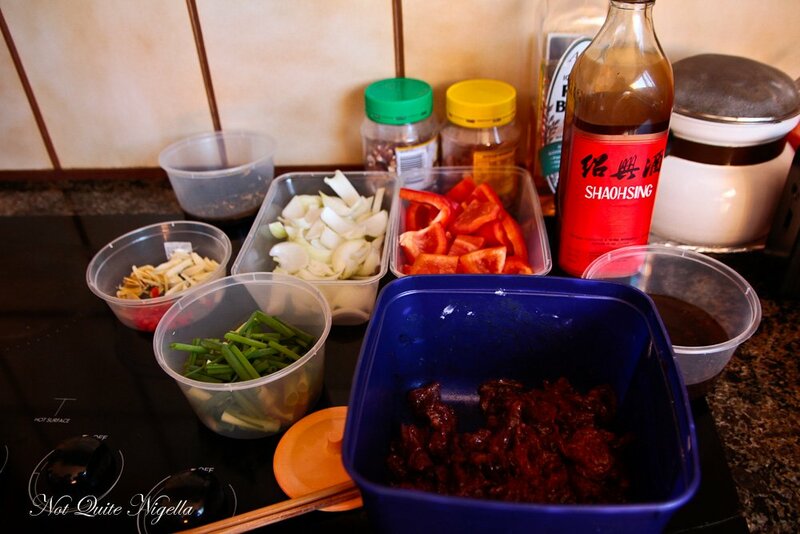 Then add red chillies, spring onion, Chinese rice wine and return the beef back to the pan. Lastly stir in the gravy mixture.